Children born outside the U.S. who have at least one parent who is a U.S. citizen acquire citizenship at birth. In order to prove citizenship, the child must have a Consular Report of Birth Abroad. This can be obtained by the child, the child’s parent or parents, the child’s guardian or someone acting in loco parents. The document does not take the place of a travel document and functions only as proof of citizenship that can be used to obtain a passport or visa or in any other situation requiring proof of citizenship. A detailed application must be filled out and submitted with supporting documents to the U.S. embassy, consulate or designated U.S. military official. The application is not to be signed until the applicant is in the actual physical presence of the designated acceptance agent. The application with detailed and comprehensive instructions for filling it out can be found at the U.S. Department of State website. There are some important documents that must be gathered and submitted in conjunction with the application and rules and regulations regarding them in order for them to be considered acceptable evidence of the parent or parents’ citizenship. When an applicant is gathering together the required documentation, it is important to note that all supporting documents must be original or certified copies of original. Certified copies bear the seal of a court, the seal of the vital records office that issued the document or other recognized authority. No ordinary copies will be accepted under any circumstances. The purpose of the application is to verify identity and establish citizenship. In order to efficiently do this, the parent or parents must submit the following citizenship and identity documents for themselves and the child. Evidence of citizenship and identity of the parents. Acceptable documents are the parent’s own birth certificate or Naturalization Certificate, Certificate of Citizenship or a U.S. Government issued passport. Parents may also submit their own Consular Report of Birth Abroad. For those who have none of these documents, contact the U.S. consul for assistance. Documentation must be presented proving that the parent was a resident or at least physically present in the U.S. prior to the birth of the child. There are a number of documents that can qualify such as evidence of school attendance, employment, tax documents, medical records, utility bills and rent receipts. Affidavits of those who know the parent or parents may also be submitted. The application form requires applicants to provide details of dates, times and places in the U.S. where they lived. Parents’ marriage certificate if they are married. If parents are married to each other and previously divorced, they must present evidence verifying that any previous marriages were terminated. If the person who is applying on behalf of the child is not the child’s parent, the applicant must provide a certified copy of legal guardianship. If that is not available, a notarized affidavit from a parent authorizing the person to act on the child’s behalf may be acceptable. There may be situations where the consular officer may require additional documentation. Thanks for the answer. I don’t understand, though. Do you mean I need a naturlization certificate for me, personally? I’m not applying to be a US citizen. I have a green card – this is for our baby. Thanks for the great information! One question, though. I’m Canadian and my wife is a US citizen. is the DS2029 for me, too? Specifically, do I need to fill out section 24-25 about dates in the US since I’m not a US citizen (yet)? All of my time with 1 exception is for conferences or visits – under 2 weeks each. Thanks! Thanks for the great information! One question, though. I’m Canadian and my wife is a US citizen. is the DS2029 for me, too? Specifically, do I need to fill out section 22-23 about dates in the US since I’m not a US citizen (yet)? All of my time with 1 exception is for conferences or visits – under 2 weeks each. Thanks! Hello, are you a US Citizen how old is your son? 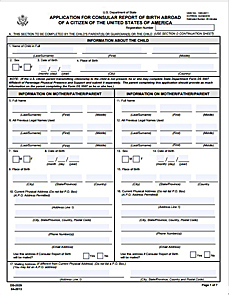 If I am already in the US do I still need to fill this form out for my son even though he was born overseas? I was born in the US and my son was born abroad we are currently in the US. How Can I report his birth here in the US? Oh thank you for that info, i wouldnt have known that the child should be present. Hello, minor passports will need to be done in person with both parents and the minors present. They will need a DS 11 app, passport photos, both parents driver’s license, passport fees ( $80 plus acceptance agent fee of $25) and original/certified copy birth certificate. Coria Janeth are you a US Citizen? U.S. Passport Help Guide Is this a yes? The same information is on the form instructions. I have the same question, but I am also wondering how precise the dates need to be. I moved from Oklahoma to Connecticut when I was three years old. I’m not sure what month that was in, and I certainly can’t remember the day. Those dates should be on his passport. can I apply with the application in the USA? Can I mail all documents to the nearest Consulate of the USA? Thanks in advance. I understand that since my child was born out of wedock and I will not be present at the CBRA interview I need to complete “Item 28” of the DS-2029 and have it notarized. My question is what to do about “Item 29” do I need to sign this also? Thank you. Where can I find my registration number on the DS-2029. I am with the U.S consulate in South Korea. Also is the last page (the checklist) filled out by me or an officer?